Wide selection of pallet styles to best fit the tools you use! All of our tool pallets are professional quality, ensuring a long life and all tool pockets are riveted and double stitched at the stress points. 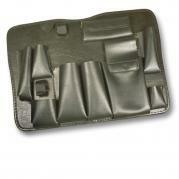 The resilient Neolux pockets have a memory for the tools they hold, providing a tight fit and superior hold. The REGULAR SIZE tool pallets shown below, measure 17.5” x 12.5”. Regular Size Pallets ONLY fit the ASB, RWLB, RLB/G, RLLB/G, TLL, PL, CLL, CXX and CWL Style Tool Cases! NOTE: Many pallets are available in either REGULAR (i.e. 64589AT) or SUPER SIZE (i.e. 64589SAT) versions. Be sure sure to choose the right size for your specific style of tool case! Unsure of which size tool pallets you need? Please use our "Tool Pallet Selection Chart" to help you choose which size of tool pallets will fit into your tool case! The chart indicates which of our tool cases accept each size of tool pallet. NOTE: For most situations, you will want to select one Top tool pallet and one Bottom tool pallet for your tool case. Neolux "Memory", form fits to the tool and holds it firmly. 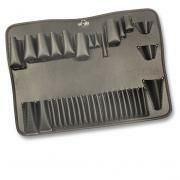 Description: 20 Pocket, Regular Size "A" Style Tool Pallet fits in the bottom portion of the tool case. One of our most popular pallets this 20 pocket pallets holds mid- and large-sized tools including pliers and some screwdrivers or other tools. Dimensions 17.5"x 12.5". Tough Neolux Material. 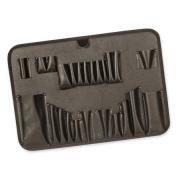 Description: 36 Pocket, Regular Size "A" Style Tool Pallet with a small latch for attachment to the top portion of the tool case. Contains 36 small to mid-sized pockets for holding lots of screwdrivers, several pliers and Xcelite interchangeable blade sets. Description: 9 Pocket, Regular Size "T" Style Tool Pallet fits in the bottom portion of the tool case. 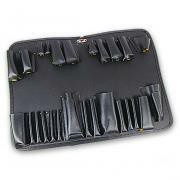 Contains 9 large pockets for telecom-related tools including crimpers, punchdown tool, multimeter and tone & probe set. Description: 29 Pocket, Regular Size "C" Style Tool Pallet with a small latch for attachment to the top portion of the tool case. Has 29 medium size pockets hold screwdrivers, pliers and other small and mid-sized tools. 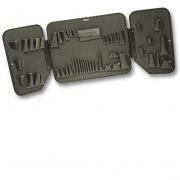 Description: 19 Pocket, Regular Size "H" Style Tool Pallet fits in the bottom portion of the tool case. 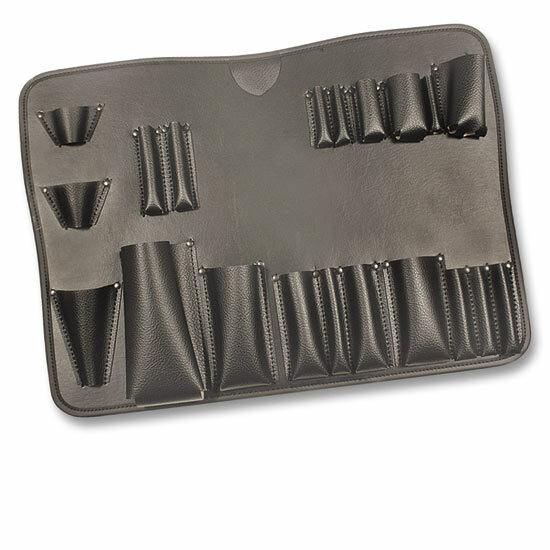 With 19 mid-sized pockets, this pallet include plenty of space for pliers and screwdrivers or nutdrivers. Description: 39 Pocket, Regular Size "K" Style Tool Pallet with a small latch for attachment to the top portion of the tool case. With 39 small and medium size pockets, this pallets is designed for screwdrivers, pliers and lots of Xcelite interchangeable blades. 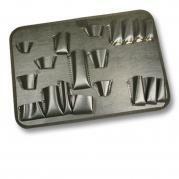 Description: 24 Pocket, Regular Size "L" Style Tool Pallet fits in the bottom portion of the tool case. 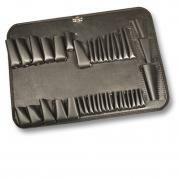 Has 24 various size pockets hold a wide range of mid-size tools including pliers and a few Xcelite Blades. Description: 48 Pocket, Regular Size Winged Style Tool Pallet with a small latch for attachment to the top portion of the tool case. The 48 pocket double wing top pallet holds a variety of mid-sized screwdrivers, pliers and a complete Xcelite interchangeable blade set. Half-size pallet "wings" fold outward on a hinge to proved access to the entire pallet at once. NOTE: This pallet is NOT recommended for ASB, CXX or CLL cases. Folded Dimensions 17.5"x 12.5". Tough Neolux Material. 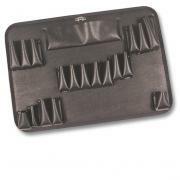 Description: 19 Pocket, Regular Size "E" Style Tool Pallet with a small latch for attachment to the top portion of the tool case. Features 19 pockets primarily designed for lots of nutdrivers and screwdrivers. 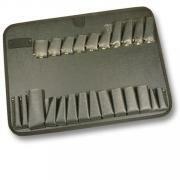 Description: 24 Pocket, Regular Size "N" Style Tool Pallet fits in the bottom portion of the tool case. These 24 pockets are ideal for holding lots of fixed handle screwdrivers and nutdrivers.